An STS-125 astronaut aboard shuttle Atlantis captured this still image of the Hubble Space Telescope as the two spacecraft begin their relative separation on May 19, 2009. The HubbleSpace Telescope appears better than new as NASA puts the 19-year-oldobservatory through a battery of tests after its final facelift by an astronaut repair crew. Ed Weiler, NASA?sscience missions chief, said Hubble is in the midst of meticulous systems andcalibration checks following the successfulupgrades and repairs by Atlantis shuttle astronauts. ?All ofthose have gone beautifully,? Weiler told reporters after Atlantis? smoothCalifornia landing on Sunday. ? ?Everything is going well, as far as I can tell.? Thecalibrations and electronics tests should run their course by the end ofsummer, with a new and improved Hubble once more ready for science observationsin late August, Weiler said. Atlantisand its crew of seven astronauts toucheddown at Edwards Air Force Base in Southern California at 11:39 a.m. EDT(1549 GMT) on Sunday, though it was early morning at their desert runway. Theastronauts returned triumphant after a 13-day Hubble service call. ?Now andonly now can we declare this mission completely a success,? said Weiler,who served as Hubble's chief scientist between 1979 and 1998. ?The astronauts are safely on theground.? Commandedby veteran spaceflyer Scott Altman, the Atlantis astronauts launched towardHubble on May 11 and performed a five-spacewalk marathon that left the iconicspace observatory more powerful than ever before. Atlantis?mission was NASA?s fifth and last-ever shuttle flight to overhaul Hubble. NASAplans to retire its three aging space shuttles fleet next year and theirreplacement, the capsule-based Orion, is designed to ferry astronauts to theInternational Space Station and, ultimately, the moon. Duringtheir five back-to-back spacewalks, Atlantis astronauts installed two newinstruments in Hubble - a powerful wide-field camera and a super-sensitivespectrograph. Theyswapped out old gyroscopes and batteries with new ones, performed two intricaterepairs to revivetwo instruments - Hubble?s main Advanced Camera for Surveys and a versatileimaging spectrograph - that were never designed to be fixed in space. Theenhancements, he added, should be the focus, and not the fact humans will nevervisit the space telescope again. ?We justrepaired the Hubble Space Telescope,? an emphatic Weiler said. ?We?ve got awhole new telescope. We?ve got four new instruments. Two of them dead, nowalive. ?These aretruly the best of times,? Weiler said. ?Not the worst of times.? Theupgrades by the Atlantis crew should extend the space telescope?s life throughat least 2014 if not longer, which would overlap with NASA?s next greatobservatory - the infrared-scanning James Webb Space Telescope slated to launchin 2013. Atlantisspacewalkers also attached a docking ring to Hubble so that, sometime after2020, a robotic spacecraft can latch onto the telescope and discard it in thePacific Ocean at its mission?s end. Weiler saidthe success at Hubble is even more poignant since the mission almost neverhappened. In 2004,just a year after the tragic loss of the shuttle Columbia and its crew, NASAcanceled the mission because of its risk. Hubble-bound astronauts would not beable to reach the safety of the International Space Station because of thetelescope?s higher altitude and completely different orbit. Weiler andHubble scientists were crushed, especially since Hubble was designed to bevisited by astronauts every two or three years for vitalmaintenance. It was anastronaut crew that fixed Hubble?s blurry vision during a 1993 service call,just three years after the space telescope launched into space with a flawedmirror. That mission transformed Hubble from a national joke into ?a greatAmerican comeback story,? Weiler said. By 2004 -two years after its most recent upgrade - the telescope was again in need ofrepairs. Instead, the mission was cancelled on Jan. 16, 2004, the day afterWeiler?s birthday. ?If youwould have told me on that day that I would be sitting her five years later,with a totally successful five-[spacewalk] mission, with a brand new Hubbleonce again that will probably operate into a third decade, I wouldn?t have betyou a penny,? Weiler said. ?This mission is a great success.? 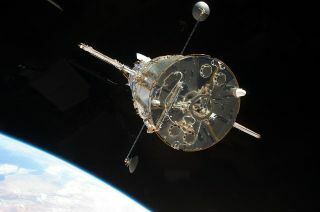 NASAresurrected the Hubble-bound mission in 2006 after resuming shuttle flights andsuccessfully demonstrating heat shield repair techniques and tools. It was heatshield damage to Columbia?s left wing that doomed that shuttle and it?sastronauts during re-entry. During the Hubble flight, NASA kept the shuttleEndeavour on standby to fly an unprecedented a rescue mission in case Atlantissuffered similar damage. No rescue was needed. NASA plansto launch up to eight more shuttle flights by 2010 to complete the space station?sconstruction. The orbiting lab is expected to reach its full six-person crewsize later this week when three new spaceflyers join the station?s currentthree-man crew. The nextshuttle to launch will be Endeavour, which will move from its current perchatop Launch Pad 39B to the nearby Pad 39A early on May 30 for a planned June 13launch toward the space station. Pad 39A isNASA?s prime shuttle launch site. Pad 39B will be turned over to the shuttle?sreplacement booster ? the Ares I rocket. The first test flight, Ares I-X, isslated to launch no earlier than Aug. 30. TheAtlantis astronauts are the last humans ever to touch or seeHubble up close. When they left the telescope last Tuesday, they recordedthe departure from Hubble and later beamed it back to Earth. ?All of ushad, I wouldn?t say wet eyes,? said Weiler. ?But it was an emotional momentbecause we knew that was probably the last time humans would see Hubble. ?